Why a Brew Day Box? Over the years I’ve homebrewed, I’ve utilized a number of storage and organization strategies. Some could be defined less as strategies and more as “piles”. These strategies have ranged from, cardboard boxes, to big totes that I threw everything under the sun into to using smaller shoe box size containers and breaking everything out into categories. The shoe box size organization method has worked well and other than a few large totes for bigger items, it’s what I’ve settled on. At some point after going to that, I realized that when brew day rolled around, I had to collect items from a number of these containers. I usually forgot something and had to look around, multiple times per brew day trying to find whatever I needed. That evolved into putting together a container just for brew days. I cleverly 🙂 call that my “Brew Day Box”. 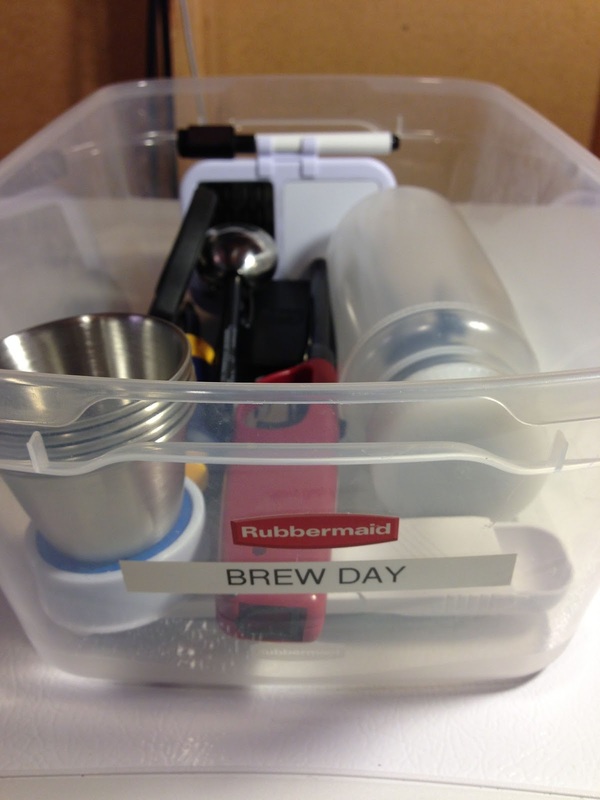 This container houses nearly all the small odds and ends that I use when brewing. I’ve also tried to make sure those things don’t really need removed at other times. 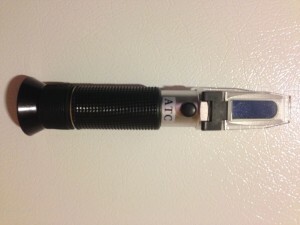 For example I use a refractometer regularly, not just on brew day, so… I bought another refractometer. 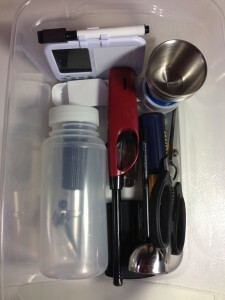 Everything that’s in my Brew Day Box generally… stay in my Brew Day Box. This keeps everything in one place and I’m not wasting time trying to find stuff when I should be brewing. #6 CDN DTQ450X Digital ProAccurate Instant-Read Thermometer-NSF Certified – via Amazon. 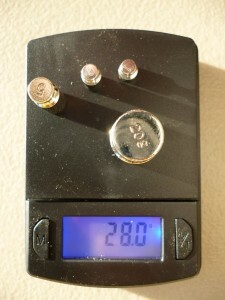 Check out my Hands on Review of this great thermometer. 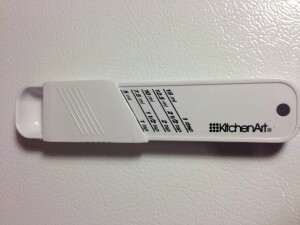 #7 – KitchenArt Plastic Adjust-a-Tablespoon – via Amazon. 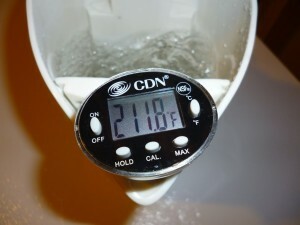 I use a measuring spoon for measuring yeast nutrient additions and other boil additions. This is another space saver. I wanted to easily fit everything in one shoe size box. At one point, I kept an entire set of measuring spoons in the box. This replaced that whole set. 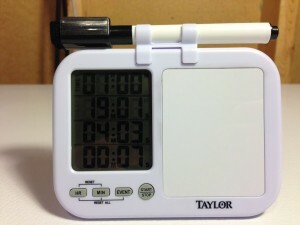 #9 – Taylor Precision Products Four-Event Kitchen Timer with Whiteboard – This allows me to time up to four hop additions and also has a handy white board for noting what hops go in when. 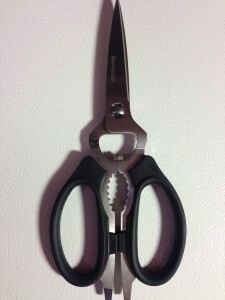 #10 – Leatherman – Wingman Multitool, Stainless Steel – via Amazon. Another great bang for the buck with regards to space. This thing is really well made and includes lots of features including pliers, wire cutters a knife, screwdrivers, a bottle opener and lots more. #11 Dual Scale Refractometer – Economic Beer Wort and Wine Refractometer, Dual Scale – Specific Gravity and Brix – via eBay, Refractometers use a sample size of just a few drops and (with the use of a calculator) can be used to measure gravity throughout the brewing process. #12 IRWIN 2051100 9-in-1 Multi-Tool Screwdriver – via Amazon. 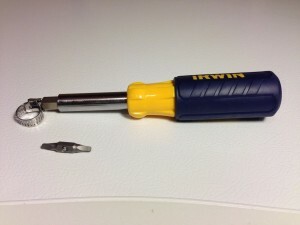 This is a handy screwdriver that gives you a lot of functions for the space. #13 Rubbermaid Clear Sided Storage Box. 6.5 quart size with snap on lids. I have dozens of these boxes. I like this specific model because: 1. The sides are clear. That makes it easy to see what’s inside. 2. 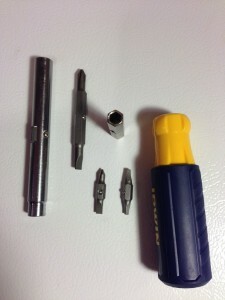 The lids are easy to snap on and take off. and 3. They stack nicely on top of each other. As of this most recent update, I don’t have an online source for these. You should be able to find similar boxes at a local store. My Brew Day box has been a big time saver, making brew days easier with less looking around for stuff and resulting frustration. Having most of the small stuff in one spot makes the brew day go more smoothly. I recommend putting something like this together. 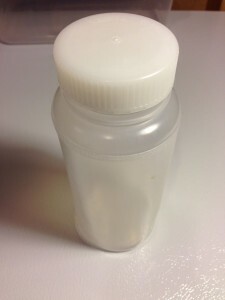 This entry was posted in Brew Day, Containers, HBF Tested, Making Brew Day Easier, Organization, Reviews & Top Posts, Storage, Timers, Tips, Top Posts on June 27, 2013 by admin. I need something like that but I don’t want to buy 12 of them. Thanks! You can find them from time to time as singles, or at least similar bottles available as singles. I did a little bit of looking just now, I didn’t find anything. 12 is a bit of an investment, but they should last you a long time. I think I’ve used (and am still using) 4 of the original 12 I bought. Cheers! The United Scientific ones seem to be comparable, including the same UNSPSC code. Agreed, refractometers are great for checking Brix on grapes in the field or wort from the mash tun, but once fermentation starts, you still need the hydrometer. The alcohol throws off the Brix readings on the refractometer. With wines, a refractometer will read about 7 brix when an initially 20 brix must is fermented to dryness, which will read on a hydrometer at 0.997. Wort will behave in a similar manner. Organization definitely makes a brew day go more smoothly. I put together a brew-day rubbermaid tub for brewing and now I have more time to drink beer instead of looking all over my basement for things I need. I also put a box together for kegging that includes wrenches, sockets, keg lube, cleaner and sanitizer, extra keg components (poppits, O-rings), etc … that I break out when working with kegs or the keggerator. All of the stuff in small bottles (the water and boil additions) fit nicely in an empty six-pack holder. I’m planning to brew sometime this weekend, so I’ll try to remember to take a picture at some point. I’ll post it on the HBF Facebook page. Agreed on having a brewday box. I use a inexpensive plastic Toolbox from Home depot. 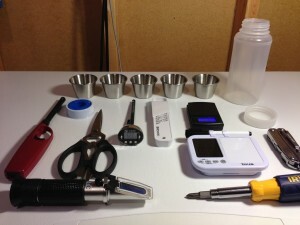 I can keep measures, scales, timers, etc in the bottom, refractometer, thermometer, hydrometer, pens, scissors, yeast nutrient, Irish Moss, and a couple odds and ends in the upper tray. 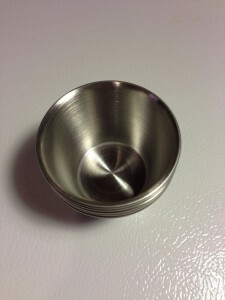 the one I have also has part organizers as well on the outside for small parts (stirbars, gaskets, etc…) it’s nice, because if I brew at a buddies or go elsewhere, it is a grab and go deal. Thanks Jon! Agreed on the refractometer. It’s a great tool!